Quick, we have to stop this train before the hard drive crashes! With a thundering sound mix drowned out only by the den of apposite popcorn-munching throughout the theater, Unstoppable is the quintessential example of a film that doesn’t try to be anything more than it is. An unmanned, half-mile-long freight train carrying thousands of gallons of hazardous phenol acid barrels through the Western Pennsylvania countryside at 70 mph, its destination the densely populated city of Stanton. 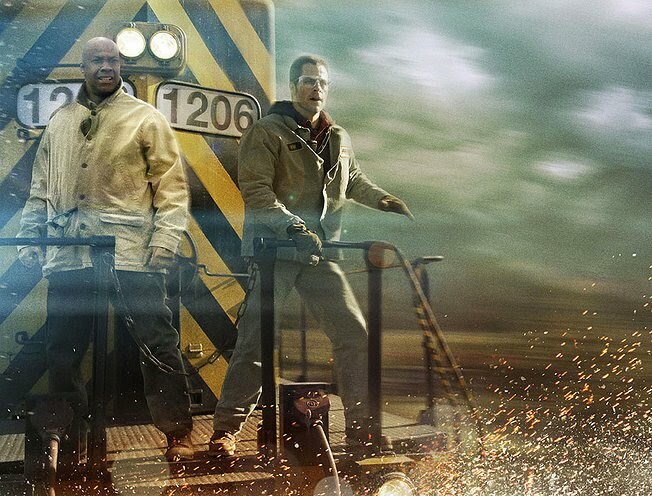 It falls on two rail workers – veteran engineer Frank Barnes (Denzel Washington) and newbie conductor Will Colston (Chris Pine) – to chase down and stop the “coaster” before disaster hits. 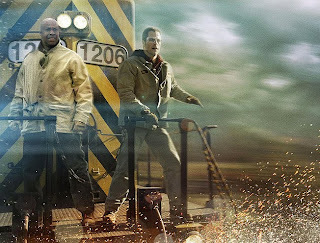 Loosely based on the 2001 “Crazy Eights” unmanned train incident in Ohio, Director Tony Scott amplifies his typical camera-in-a-blender action sequences with depictions of frenzied media coverage – including swooping news choppers, filmed using other unseen choppers – and dubious corporate agendas being foiled by hardnosed track manager Connie Hooper (Rosario Dawson). And, Barnes and Colston are provided just enough back-story while riding the rails to feign character development. Mostly, however, this is prototypical white-knuckle intensity that is slickly produced and – notwithstanding the pseudo-elephant trumpet that blares every time the runaway train rolls by – more reserved than Scott and Washington’s more recent collaborations, Man on Fire, Deja Vu, and The Taking of Pelham 1 2 3. Unstoppable fits the criteria of the sort of movie Max Cherry said he wanted to see in Jackie Brown: something that starts soon and looks good.